The Importance of Storytelling over Statistics. A Powerful Research Study. We often think facts and figures are great at motivating people. The truth? They aren't nearly as effective as story. Read on to find out more about the importance of storytelling over statistics. How can one Jessica in a well cause more action than 66 million endangered girls in Africa? The year was 1987. Jessica, who was only 18 months old at the time, wandered into her family’s backyard and fell into a well. The well was only eight inches in diameter. Jessica’s mother had just briefly stepped inside the house to answer the phone. Eight inches and a few minutes were all it took for Baby Jessica—as she is now known—to find herself lodged nearly 22 feet underground. What happened next is so unreal it could only be a true story. Within 3 minutes the police were on the scene. The well was far too narrow to try and go straight down. Jessica was far too young to simply drop a rope down and pull her up. Rescuers devised a plan to drill a hole parallel to the well and then tunnel sideways to the spot where Jessica was trapped. It seemed like a plausible plan. Everyone was hopeful that it could be achieved rather quickly–a few hours perhaps. At the time, CNN was the nation’s only 24/7 televised news network. 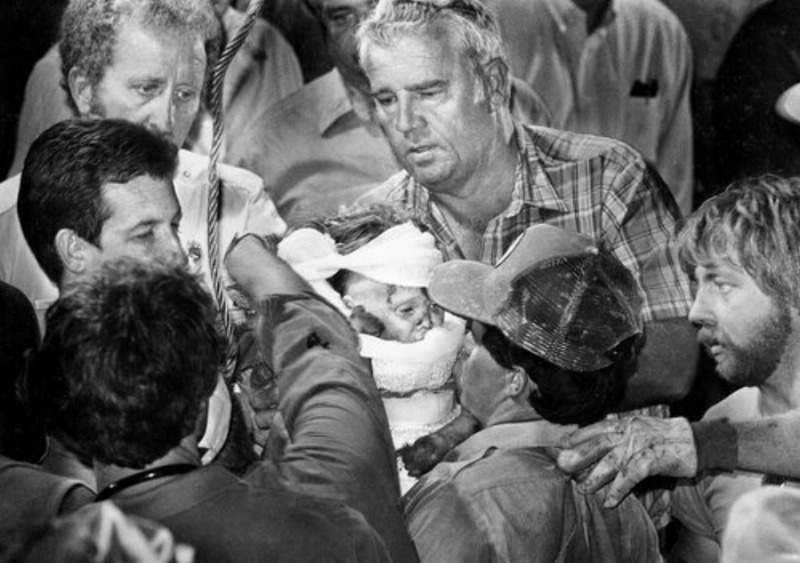 Reporters from the network descended on the scene, broadcasting the story of Baby Jessica across the United States as it unfolded live. The rescue team got to work using a large rathole rig, a contraption normally reserved for putting telephone poles in the ground. It took about 6 hours to get the parallel hole dug, and then they went to work on the tunnel. This is when they really hit a snag. The jackhammers that they’d planned to used to dig their tunnel...it turns out they’re designed to remove the ground below a person, not beside him. Therefore, the jackhammers weren’t nearly as effective in creating a tunnel from dug hole to well. The rescue mission slowed to a crawl. While this was happening, others on the rescue team remained in constant contact with Jessica, asking her to sing as a way of raising her spirits. Those at the scene still remember her singing “Winnie the Pooh” while lodged 20 feet underground. It took nearly 58 hours for rescuers to make their way down, and then over, to rescue Baby Jessica. What happened next is really the point of the story I’m sharing with you. Then-President Ronald Reagan said that "everybody in America became godmothers and godfathers of Jessica while this was going on.” There was a television movie made about her, the family appeared on Live with Regis and Kathie Lee, and a photo of her rescue went on to win a Pulitzer Prize. More incredible than all of the media hoopla that resulted from the incident was that Jessica received a trust fund that was dispersed on her 25th birthday. It was funded by donations that were sent in from around the nation at the time of her mishap. Baby Jessica, the young girl who got stuck in a well and 58 hours later was safely rescued with minimal injuries, had amassed nearly $800,000 in donations. That is pretty remarkable. Even though she was rescued and back safely with her family, this one incident raised a MASSIVE amount money (and remember this is 1987). Now what if I told you that there are over 66 million girls across Africa who don’t have access to education. Girls not that different from Baby Jessica, who without any help, are more likely to be sexually abused than attend high school. Therefore we would expect that if we were to broadcast this 66-million-girls fact on CNN for 58 hours straight that America might donate $800,000 times 66 million, right? I mean, that number of girls would attract donations that would be some crazy, crazy out-there number. If just one girl can invite such generosity, imagine what 66 million girls could invite. Clearly, that expectation couldn’t be farther from the truth. But why? Why does this one story of one girl in a well generate such a massive response, yet I can tell you about a massive problem and it generates little to no response? It’s called the Identifiable Victim Effect and it refers to what happened with Baby Jessica. When one identified victim is made into a cause, there can be an outpouring of support. Yet when there is this enormous need, there is often far less action and people’s response can be much more callous. One group of researchers decided to take a look into this. Here’s what they did: They’d walk up to university students and ask if they’d be willing to answer brief surveys in exchange for $5. The survey asked questions about a contemporary tech product—but the survey itself didn’t matter. What mattered was what happened when they received their $5. Upon completion of the survey, each student was handed five one-dollar bills along with an envelope and a letter. They were told that they had an opportunity to donate any of their earnings to the charity Save the Children and were asked to read the enclosed letter. Half of the letters shared information about a statistical victim–so imagine facts and figures right from Save the Children’s website. Whereas the other half received the picture of a real girl and information about her, also taken from the charity’s website. Here's a contemporary example. Participants who were told about one real person donated over twice the amount of those who were told about the much larger problem, but in the form of statistics. That’s a powerful result with some far-reaching implications. Simply sharing one specific person generated much more action than that of the much larger statistical problem. The researchers also tried another variation of the study that you need to hear about. This time they had another group–the third group was given first the identified person and then the statistic. So naturally we’d expect that this group, the one that receives both the information about the identifiable person and the stats would generate the most impact, right? It was again the identifiable person information that raised the most, but this time it raised more than both the stats or the stats and identifiable person together. The identifiable person raised over double the statistic and the combo of stat paired with the person didn’t fare all that much better than the statistic alone. This has huge applications if you’re a nonprofit or telling a story for a group that needs to raise money. This is some solid evidence to support the idea that a single story will raise more awareness and money than a statistic. More than that though, this has much broader applications in storytelling in general. To maximize a story’s connection to the viewer, in telling stories that connect, we need to have one main character—a Heart of the story. This research proves that one strong character will always connect with audiences better than a group or a statistic. So often in commercial or documentary work we try to please everyone involved, or we agree to clients’ requests to feature the whole team. The end result could be a handful (or more) characters in a story. Whether through our indecision or the political challenges of having one character lead, we try to connect with viewers through a group of characters. We think that perhaps each might add a little, and when combined, will create a stronger connection. But that’s not how story works. Each one of us is just one person and we connect more to just one person, and therefore connect more to a story with one lead person–and it’s her conflict, her journey, that we want to stick around for. The next time your client wants you to focus on statistics rather than story, send them right here to learn the importance of storytelling, ideally through a single perspective. This is just one study in a long line that repeatably shows that telling one personal story will lead to more action than any statistic.